Wisconsin Sports Tap: Abandon Ship? I’ve been a McCarthy supporter since day one. Literally. 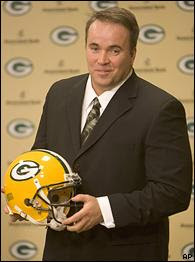 I remember when people were griping about bringing in the offensive coordinator from a San Francisco team who struggled mightily for one season, but his message of instilling a sense of history and building around what he termed “Packer people” was one that I appreciated and was excited for. And he didn’t let me down. After a rough first season, we were rewarded with an NFC Championship Game appearance, and let me tell you, I was feeling pretty good about being on the bandwagon at the very beginning. Well, this week I’m finding myself sheepishly sneaking over to the back hatch. The Tampa Bay game has a lot of people pointing fingers at a number of places, and some of it has been unfair. For a while I was thinking this team just isn't that good, maybe it was all Brett Favre making the team look better than it was. But if you dig a bit, you'll see that there is a lot of talent on this team. Need proof? Look at the stats. Rodgers is a top-5 QB in the league. Should he finish the season at the rate he's at, he'll have 32 TDs to 10 INTs and 4500 yards. The team's passing, rushing, and total offense all rank in the top-10. Team defense is in the top-5 in yards allowed. By all these measures, this is a very good team. But the team penalties. The missed assignments, the confusion and broken plays. These things fall on the coach. The abandonment of the short passing game in key situations, an inability to rush the QB. These things fall on the coach. They’re schematic and disciplinary issues, and that’s Mike McCarthy’s department. He says week in and week out that they’re trying to address these issues in practice, but 8 weeks in it’s pretty obvious that he’s not getting through to these players. So what now? Well, now you play out the season and hope for the best. Who knows? Maybe I’m wrong. Maybe something will click after hitting the proverbial rock bottom last week, and the tackles will stop jumping before the snap, Rodgers will start getting the ball out quicker, and Romo will be picking Lambeau sod from his teeth on a regular basis next Sunday. The team bounces back, gets the wild card, and takes out the Vikings in their third shot at Favre. I’d love that. More likely, however, is 7-9, no playoffs, and a new coach for 2010. Sorry Mike. I'm not completely off the wagon, but I'm really questioning the direction its in right now. I too was all about his hiring when it happened, and similarly was pleased up until this year, so I agree with everything you say. I just want to make a mention that for the same statistics of performance that you've mentioned are the same reasons people need to get off of Ted Thompson's back. I am still a fan of his, and aside from the O-Line, has put together a solid team. I am getting real tired of all the penalties and mistakes. I can't even get excited about a big play anymore, because I'm waiting to see if there is a penalty. At some point someone needs to be held accountable. In fact Mccarthy said after the last game it may have been his fault for working the players to hard. What!! 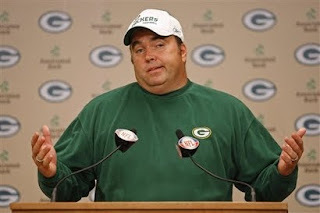 That being said, I'm still sticking with McCarthy. Well, unless Bill Cowher is available and then I'd dump him in a second. The Catcher of the Future, Today!